We probably haven't heard enough about the audiences of black boys and young black men in the coverage of Ta-Nehisi Coates's works. But they're here. At least in my world they are. Some years back, in my course for first-year black men, we covered Coates's The Beautiful Struggle (2008). The guys enjoyed the book, especially the ways Coates highlighted the importance of rap as well as his discussions of the challenges navigating a tough neighborhood. The majority of my students were and are from the South Side of Chicago; what Coates described about Baltimore reminded my guys of their own environments. When one of the high school teachers from East St. Louis that I collaborate with asked me about book suggestions, I mentioned talked about the experience of covering Coates's memoir with my guys. The teacher assigned The Beautiful Struggle for a reading group at his school, which is how many of the boys first became aware of Coates. When I'd visit for after-school activities, the high school guys were always engaging me in conversations about Coates, about his discussions of rap music and the ways his Baltimore experience resembled their East St. Louis experiences. 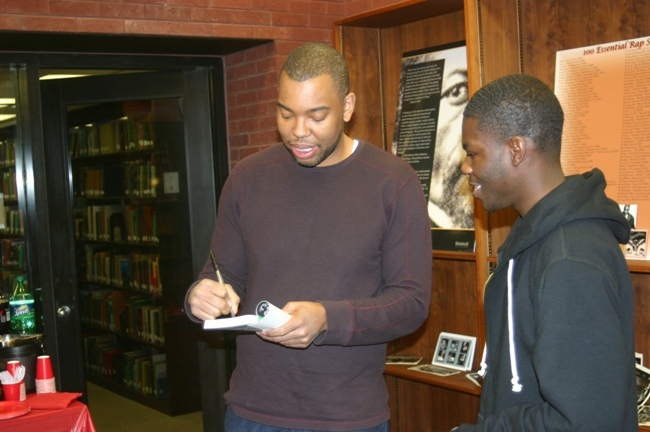 Coates autographs The Beautiful Struggle for my student Dometi Pongo at SIUE, March 2011. Over the last couple of years, I gave my first-year guys activities related to the coverage of Trayvon Martin produced by Coates and Trymaine Lee. My guys from 4 years ago thought of Coates as the writer of a memoir; my more recent guys were now thinking of Coates primarily as a blogger. Many of those more recent guys were the exact same age as Martin, so they were deeply invested in the coverage that Coates and Lee provided. Last fall, I coordinated a reading group focused on Coates's Between the World and Me (2015) with collegiate black men at the university. More than anything, Coates was giving the guys a vocabulary to discuss their worries about the vulnerabilities of their own black bodies. Some of the guys were also interested in Coates's movements--from Baltimore to Howard University to New York City to Paris. I prompted them to also consider his movements as a writer--from aspiring rapper to poet to journalist to memoir author to blogger/journalist to prominent commentator on race in America. 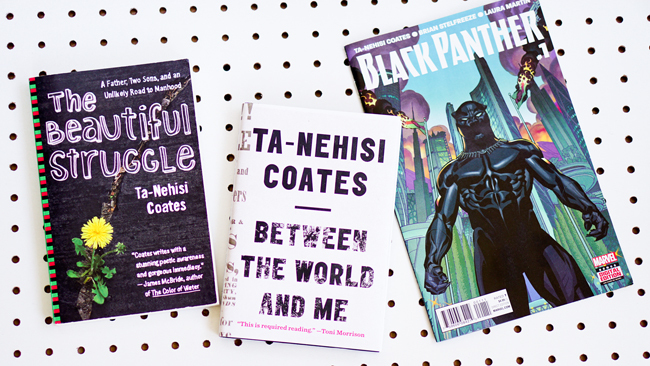 These days, I've been following along with Coates's The Black Panther. I can hardly wait until the release of the trade paperback, which will make it possible for me to assign the book in the classes for my first-year guys and for a reading group for the comic book fans at the high school in East St. Louis where I volunteer. I've heard the debates concerning "who is Coates writing for?" In the world where I teach, he's been producing an engaging body of work for black boys and young black men.